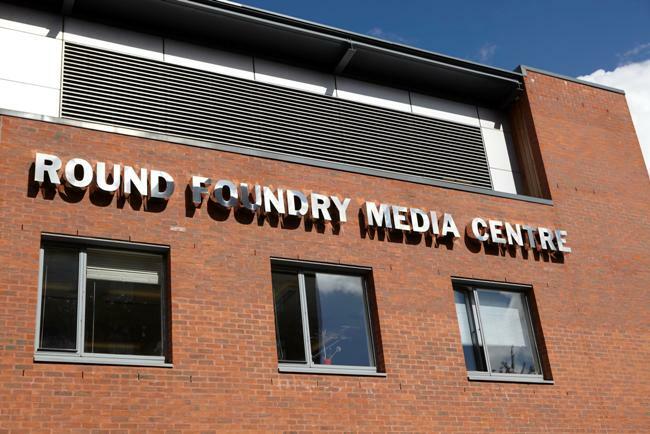 Leeds City Council has renewed its lease on the Round Foundry Media Centre [RFMC], continuing the building’s reputation as the place for high growth creative, digital and media businesses in the city. Located in the thriving Round Foundry and Marshall’s Mill estate, part of the city’s emerging South Bank; the Media Centre opened in 2003 with Leeds City Council taking up the lease in 2014. Offering flexible work spaces and virtual office services as well as meeting rooms and conference facilities, the RFMC has proved very successful with around 60 per cent of these small businesses expanding into larger spaces within the surrounding area. A lot of that success can be attributed to the work of Creative Space Management [CSM] who manage the RFMC and Workman LLP who manage both Marshall’s Mill and the Round Foundry. These companies along with Leeds City Council have created a community of like-minded businesses and an environment which includes the capacity to grow into larger spaces across the estate and is designed to help them succeed. This approach has resulted in serial entrepreneurs making the RFMC their home. Entrepreneurs such as Robin Hill and Andrew Mason who recently returned to RFMC with four new co-founded tech start-ups RapidSpike, InfoSecurity People, Data Protection People and Pentest People following success with their first tech company, RandomStorm, which began at the Media Centre in 2009. This debut company was sold in 2014 for £10m. Paul Taylor, director of CSM, said: “Starting any new enterprise can be daunting and what we have all worked very hard to create across the site is a place where small businesses can find their feet and gain confidence from the community around them. An integral part of this rapidly growing sector in the city’s economy, the Round Foundry and Marshall’s Mill estate has nurtured businesses including digital marketing company Simplicity Marketing TA Flashtalking which has grown from a Pod in the Media Centre to offices taking almost 7,000 sq ft of space in Marshall’s Mill. The site has also provided a supportive home for small businesses moving from other cities. Market research company SimpleUsability re-located to RFMC form York as just two people, the business was able to expand into larger offices, before moving across the road to take almost 4,000 sq ft in Marshall’s Mill. These are just two of the success stories which are adding to the buzzing South Bank of Leeds and maintaining the area, only a few minutes’ walk from the South entrance to Leeds Train Station, as a hotspot for entrepreneurial industries. Cementing its reputation as a great place for growing businesses, the Round Foundry and Marshall’s Mill estate, has a consistently high occupancy rate of 90 per cent. There are a number of established food and drink businesses on site creating an important neighbourhood community including well known institutions The Cross Keys and Midnight Bell as well as one of Leeds’ newest contemporary fine dining restaurants, Matt Healy x The Foundry.